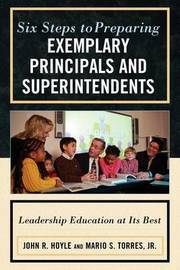 Six Steps to Preparing Exemplary Principals and Superintendents is the first book to inspire and guide professors and program administrator's proven ways to prepare exemplary principals and superintendents for schools. The authors review issues surrounding extreme criticism of leadership education and counter with positive new research and practices that clearly highlight successful programs that link preparation to on-the-job successes of graduates. The reader will find a step-by-step guide to selecting the best students, creating a pre- and post-assessment of student learning, a well-designed procedure to pretest and assure that all masters degree students actually acquire a strong knowledge base and score well on state licensure exams. The final step provides proven questionnaires to survey graduates of the masters or doctoral programs to gather valuable feedback for constant program improvement and relevance to the real world of schools. John R. Hoyle is a senior professor at Texas A&M University and has served as a public school and university teacher and administrator for fifty-two years. 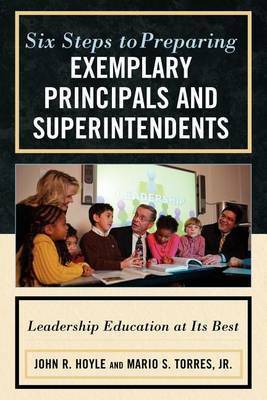 He has authored over 150 scholarly publications, including the AASA Guidelines for the Preparation of School Administrators and the AASA Professional Standards for the Superintendency. Mario S. Torres, Jr., is an assistant professor at Texas A&M University and a former urban school educator specializing in education law and policy. He has published in the field's premier journals including Educational Administration Quarterly, Education and Urban Society, and the BYU Education and Law Journal.